SCADALink IP100Serial-to-Ethernet Gateway, Multiport Industrial Terminal Server, Modbus Multiplexer / DF1 Multiplexer designed for SCADA and Automation Applications. The SCADALink IP100 is a Serial-to-Ethernet Gateway, Multiport Industrial Terminal Server and Modbus Multiplexer designed for SCADA and automation applications requiring serial connectivity of LAN/WAN and Internet Networks. The IP100 enables IP access to serially connected devices such as PLC’s, RTU’s, SCADA hosts, Flow Computers, Data loggers and Radio Modem systems. Unique features such as multiple host connections and simultaneous TCP, UDP and Modbus TCP ports gives it flexibility and scalability in automation and SCADA applications. 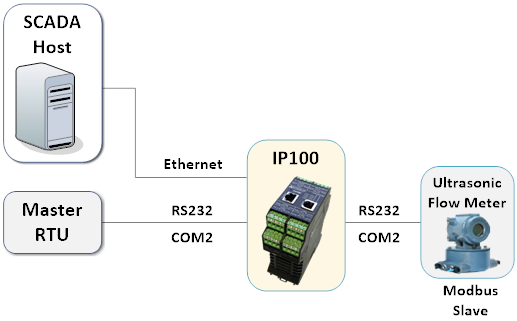 To maintain system availability for critical operations, the IP100 can be set up to provide a redundant connection through a serial or Ethernet interface. 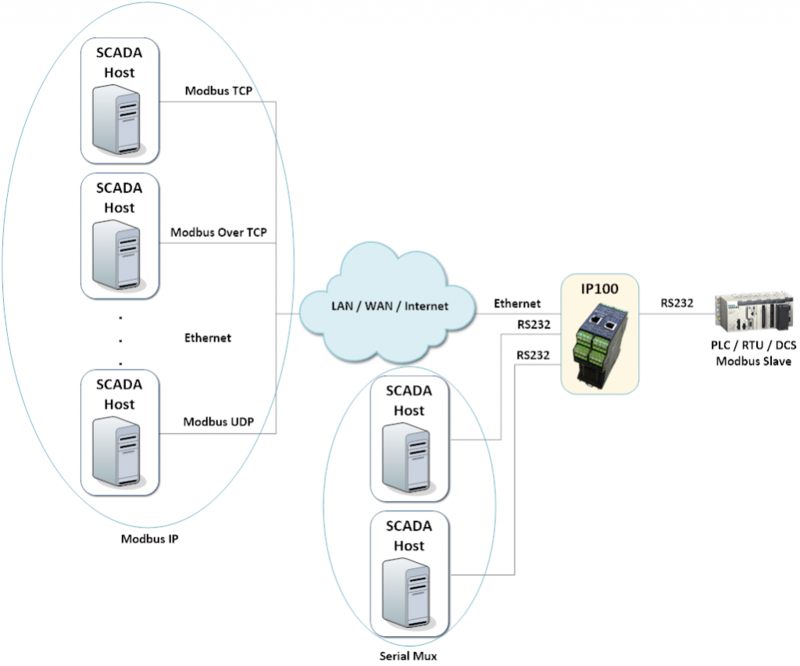 The failover provides a backup link should the primary connection between the SCADA Host and the IP100 becomes unavailable. A built-in Monitor tool enables serial communications diagnostics by providing users with real-time protocol analysis capabilities on selected serial channels. Configuration is done via simple windows GUI or ASCII Terminal. The IP100 is a compact replacement for the SCADALink IP Gateway with additional ports and expanded functionality. The IP100 can be configured for the following Operating Modes. It also supports multiple, simultaneous operation of these Modes. 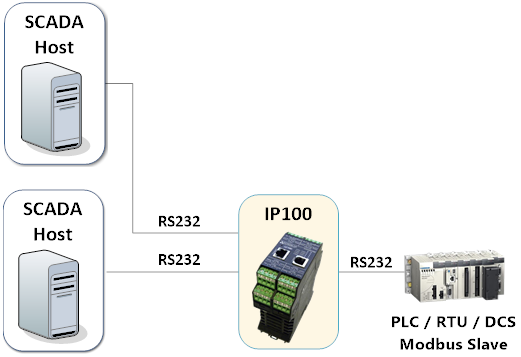 Modbus IP mode allows multiple simultaneous IP connections to a single serial port. Ports can have multiple simultaneous protocols including TCP, UDP, Modbus TCP. This mode enables an IP100 serial port to be connected from a remote device via a TCP socket connection, creating a virtual serial link. The connection is bidirectional; data can be initiated from either side. The remote serial port that establishes a connection with the IP100 can be another IP100 in Virtual Serial Client mode, a terminal server in Client mode or Serial-to-IP software in Client mode. This mode enables an IP100 serial port to connect to a remote serial port via a TCP socket connection. The connection is bidirectional; data can be initiated from either side. The remote side serial port can be another IP100 configured as Virtual Serial Server, a terminal server in Server modem mode or serial-to-IP software in Server mode. This mode is used to enable a remote ethernet host to periodically interrupt communication between two serial devices connected to the IP100. Under normal circumstances, there is a bidirectional communication between devices on the 2 IP100 serial ports. If the IP100 detects a TCP socket request, then it overrides the serial-to-serial communications. While the TCP socket is established, any data from the other serial device is discarded. Modbus Multiplexer mode enables multiple serial Modbus Masters to communicate to a single serial Modbus Slave port. Up to 4 hosts can connect to a single serial port. This IP100 mode enables a serial master to communicate to serial slaves using a variety of protocols. 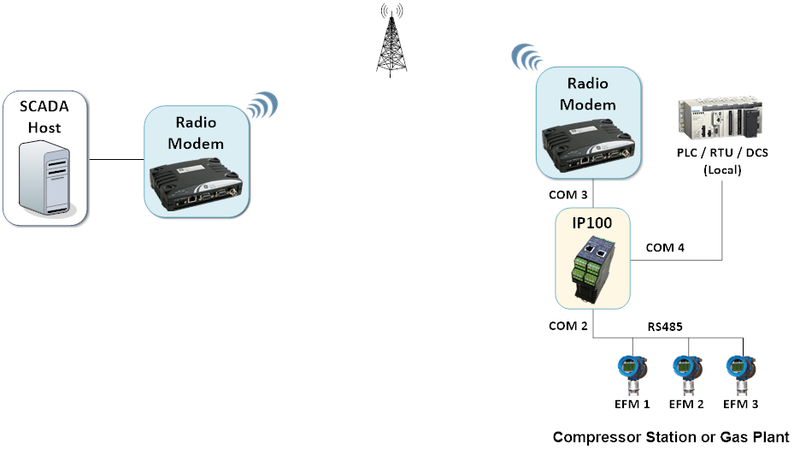 There are two modes for the Serial Master – UDP broadcast and RTU address based routing. UDP Broadcast – In this mode, the serial message is broadcast to a list of UDP slaves (IP address and port number). The UDP broadcast mode is protocol independent.This mode can be used for SCADA system upgrades involving Leased Line Replacement by IP Communication. The IP Communications can be Cellular, Satellite, or ADLS. RTU Address Based Routing uses an RTU address lookup to route to an IP device. In the example below, gateway A routes the message using the lookup table. It extracts the Modbus address from the message and uses it to determine the output protocol, IP address, and port number. 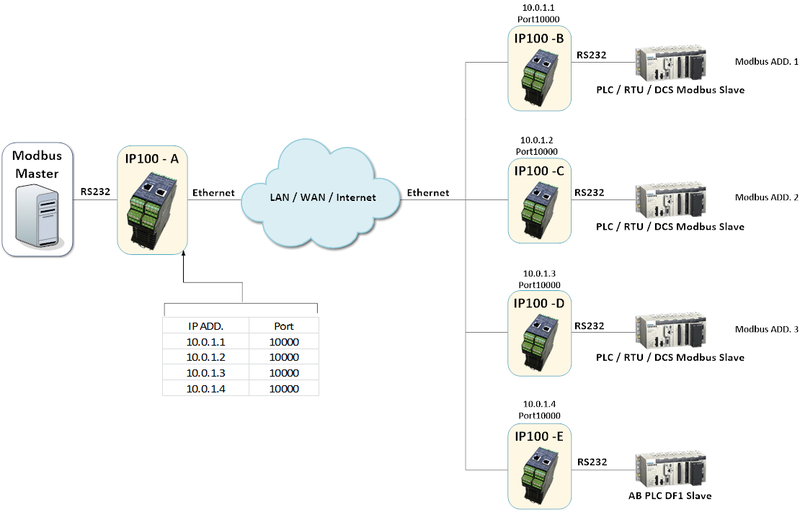 The IP100 supports DF1 protocol Multiplexing to allow the sharing of Allen-Bradley PLCs by multiple SCADA hosts. The IP100 also features mix protocol Multiplexing, allowing Modbus and DF1 protocol to be simultaneously multiplexed to the same port. 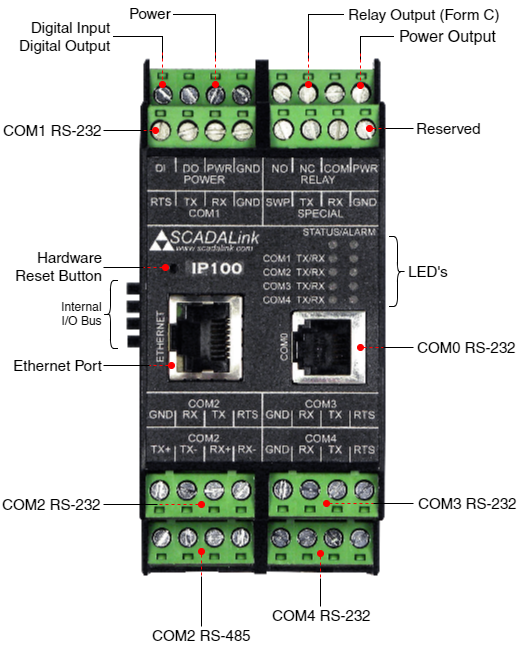 The IP100 supports connection of SCADALink I/O Expansion Modules via the I/O Expansion Bus. 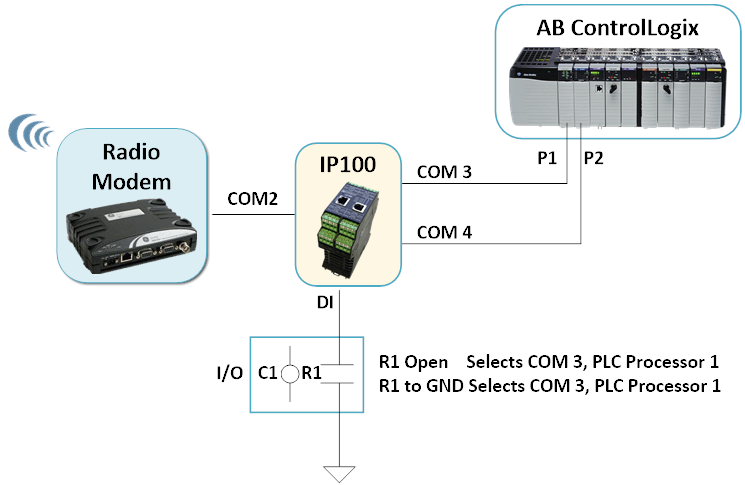 This enables the IP100 to provide Modbus Addressable (Modbus RTU,Modbus TCP, Modbus via TCP, Modbus via UDP) I/O. In more complex applications, the IP100 can be configured for multiple simultaneous Operating Modes. This system emulates a serial link using an IP100 configured as a Virtual Serial Client and another as a Virtual Serial Server to enable 2 serial devices to communicate over ethernet/internet. The drawing shows Modbus devices but the devices could use any serial protocol because the message flows directly through the gateway without change. Multiple virtual server clients can be used when an application requires connection to multiple ports of the same serial device. An example is when both a SCADA Host computer and Diagnostic computer need to simultaneously connect to a SCADA radio that has a primary communication port and a diagnostics port such as an MDS radio modem. The IP100 GUI is a windows based application used to configure, save and restore IP100 settings. In addition, the GUI provides access to the IP100 Monitor for serial port protocol analysis and control of onboard digital I/O. It is connected to the IP100 via ethernet or serial cable to COM0 or COM1. The IP100 has a Monitor function which enables the user to monitor serial communications traffic on any of the IP100’s 5 serial ports. The Monitor function displays in the IP100 GUI or in an ASCII Terminal connected to the IP100 and is useful for diagnosing and troubleshooting SCADA Communications. 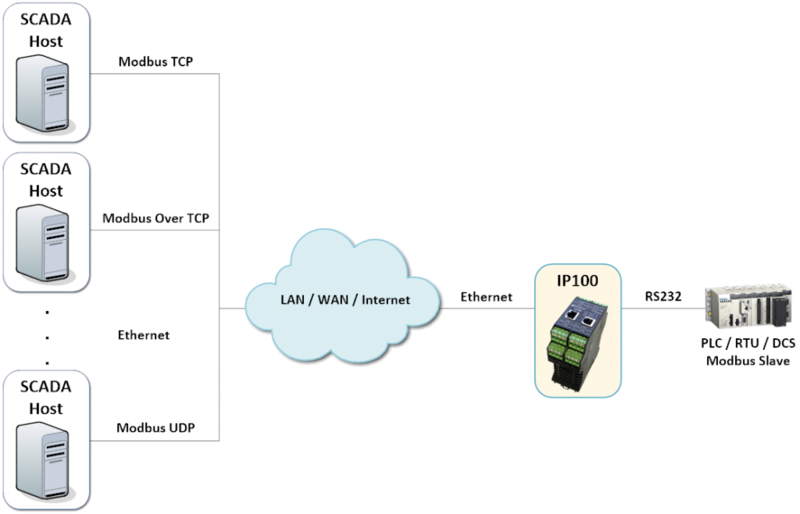 How do I configure the IP100? The IP100 can be configured using the configuration tool called the IP100 GUI. 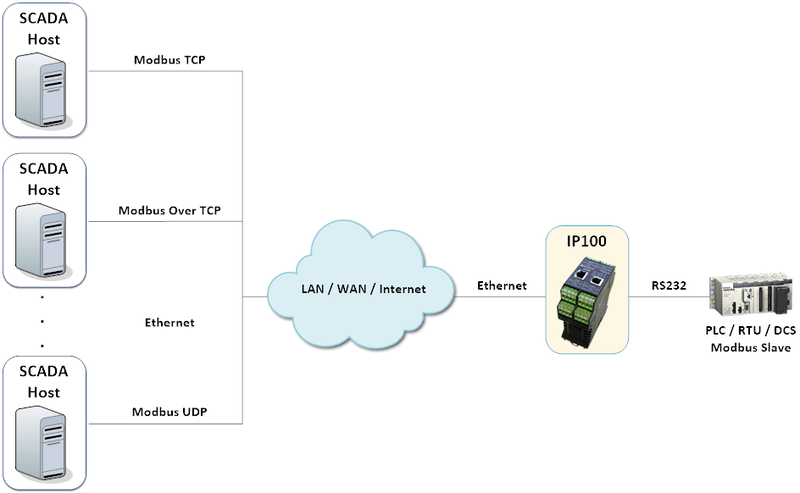 The IP100 GUI can connect serially (COM0 or COM1:) or via ethernet. I want to use the IP100 to allow two SCADA Hosts to simultaneously connect to a serial wireless SCADA radio network. How do I configure it? Configure the IP Address, netmask, and default gateway of the IP100. Configure Serial Port parameters. Use serial port (typically Serial Port 2) to connect to radio modem. Configure the serial port parameter to match serial port configuration of radio modem. Configure IP Multiplexer to define IP Protocol (typically TCP over IP) and IP port number associated with the serial port 2. Configure the maximum number of simultaneous connection to the IP socket. This number must be equal or greater than the number of simultaneous SCADA hosts. In this case 2. The IP100 has onboard I/O. What are these used for? The IP100 has 1 Digital Inputs, & 3 Digital Inputs. The 3 Digital outputs are Open Collector DO, Relay, & Switched Power. 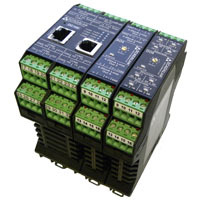 These I/O can be monitored and controlled directly the GUI over serial config port or via IP. 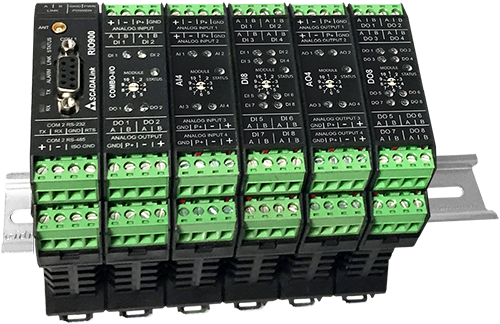 These I/O are also mapped to Modbus Registers and can be accessed if the IP100 Modbus RTU is enabled and assigned a Modbus RTU address. The digital outputs can be used to control and reset remote devices. DO is an open collector output, Relays is a form C relay. SWP is a sourced output, sourced from the power input of the IP100. For device reset operation always set outputs to PULSE mode. The SWP output is good output for powering devices powered by the same voltage source as the IP100. No other external relay is required.